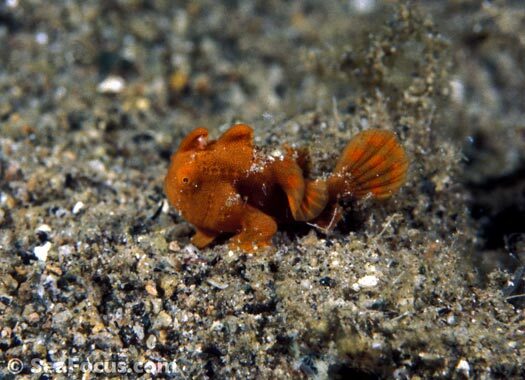 The fish family antennariidae, is a distinct group of predatory fishes, with 12 genera, at least 41 species and one very special feature – their modified dorsal spine which acts as a lure for unwary prey. 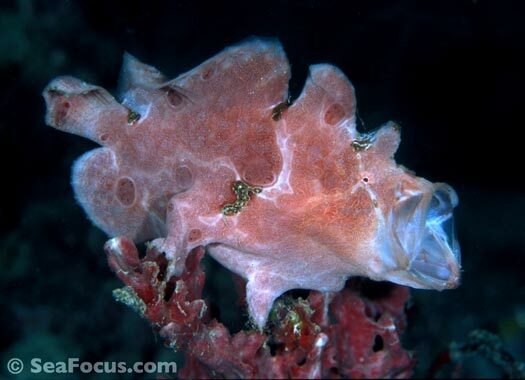 Mostly referred to as frogfish, 'anglerfish' would be a more accurate description of the way these creatures live, act and feed. 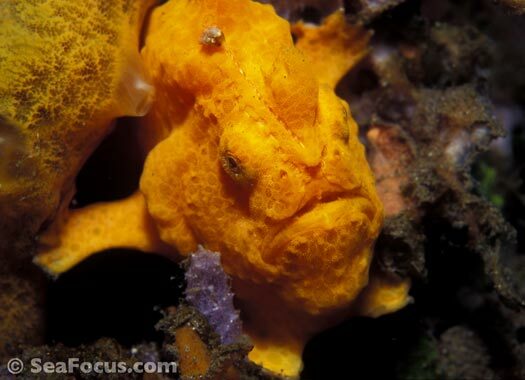 Frogfish vary in size from five to 40 centimetres. 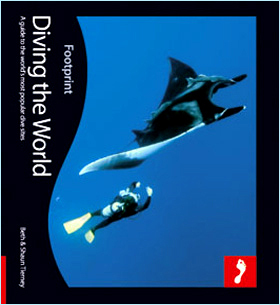 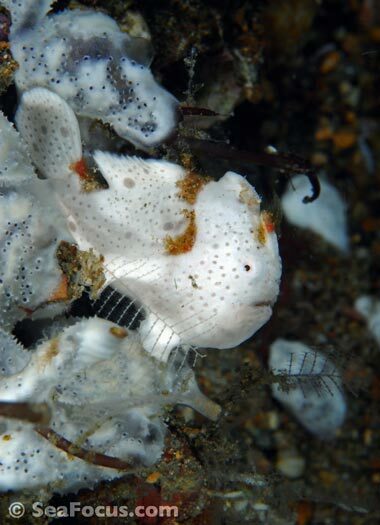 They have loose prickly skin, limb-like pectoral fins that look like fingers and toes and an elbow-like joint. 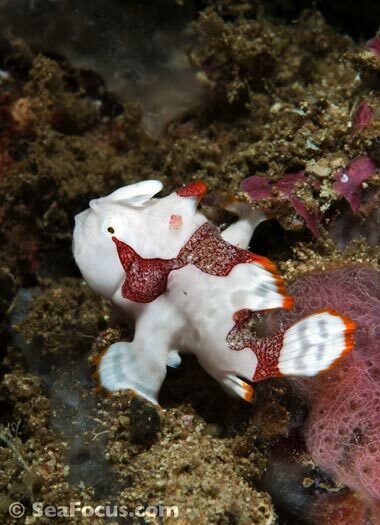 Their first dorsal spine has adapted into a movable fishing rod – the illicium – and is tipped with a lure – esca. 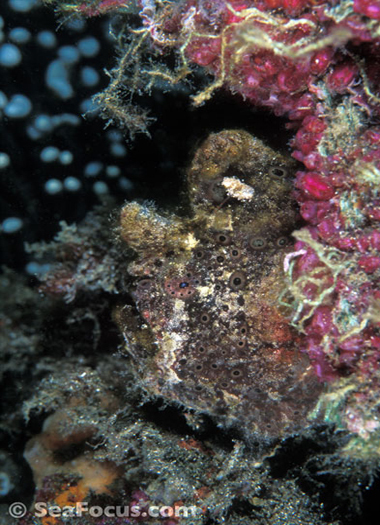 They tend to dwell on or close to the sea floor and appear to prefer an environment that has rocks, coral reefs, seagrass or anything that affords them some sort of camouflage and a passing array of suitable food. 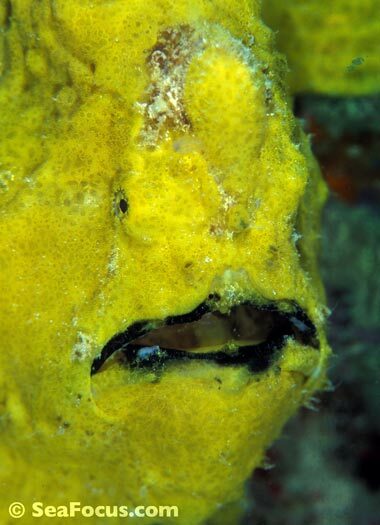 When something appetising passes by, they wiggle their rod and lure in the water column and then if they prey approaches they can extend their jaws in an ultra-fast yawning motion, sucking it in without ever being seen. 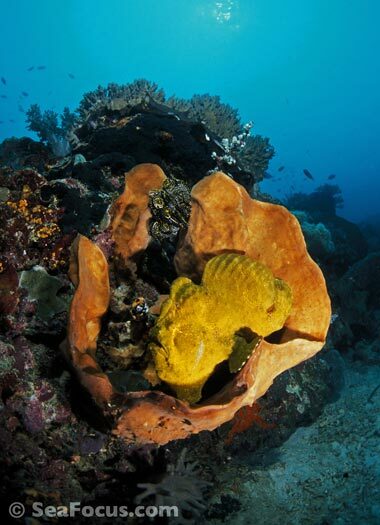 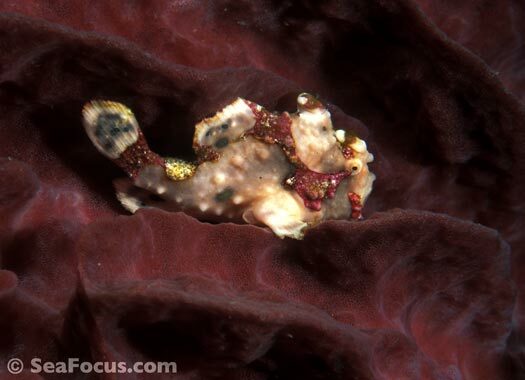 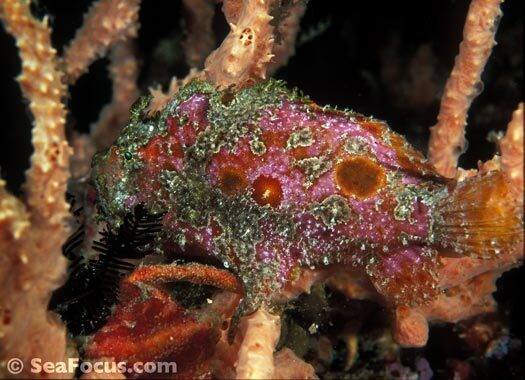 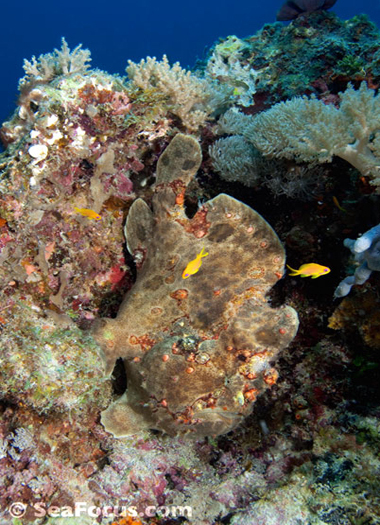 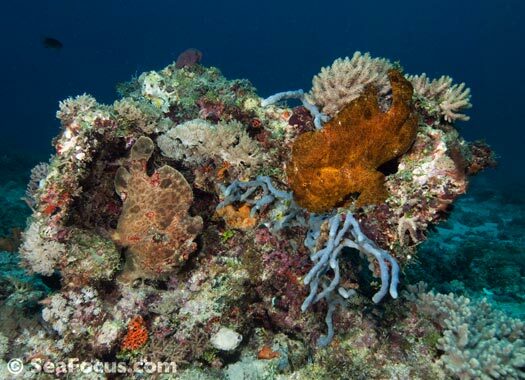 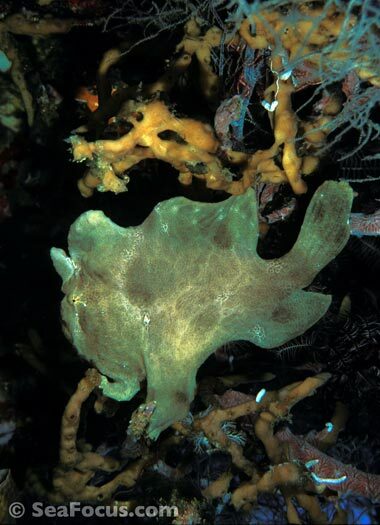 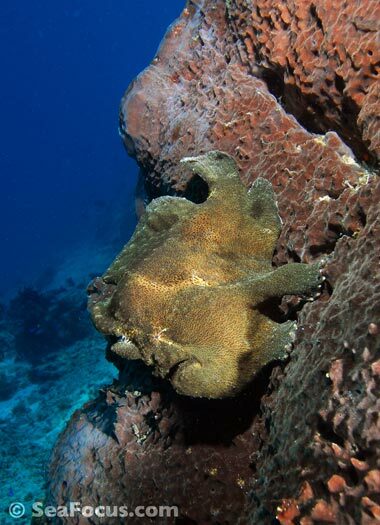 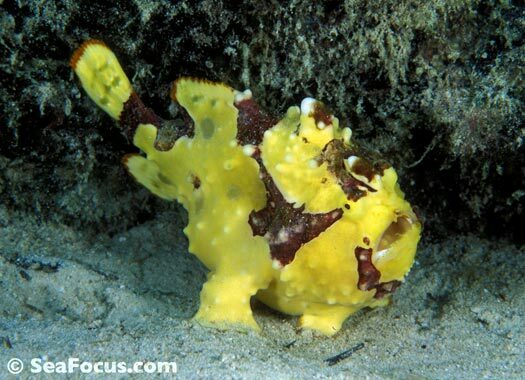 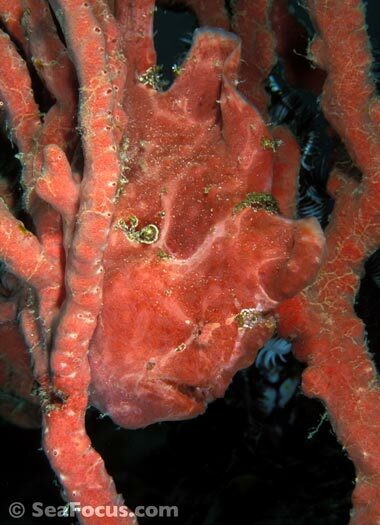 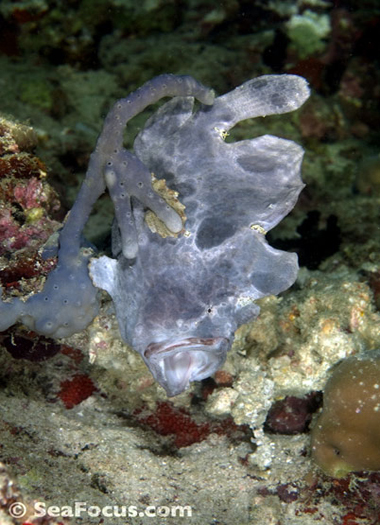 Frogfish have taken the art of camouflage to the max. 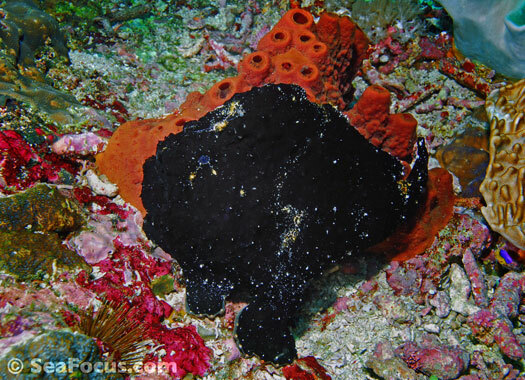 Spotting a jet black froggy on a black coral tree or a pure white one nestled on a pure white sponge can be a challenge. 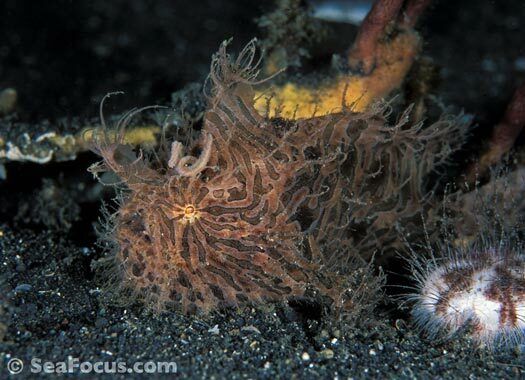 Some species use their hairy status to wander a sandy seabed and look like nothing more than a bit of flotsam or fuzzy coconut husk. 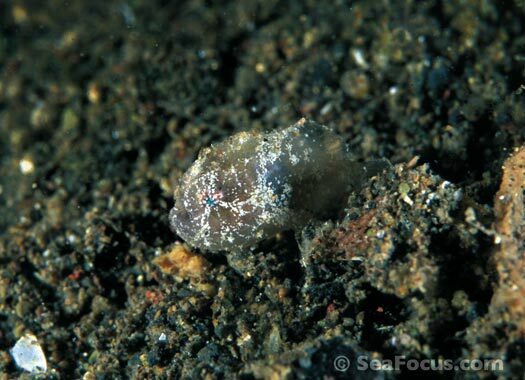 Some juveniles are even known to mimic colourful nudibranchs as nasty tasting nudis are rarely preyed upon by other creatures. 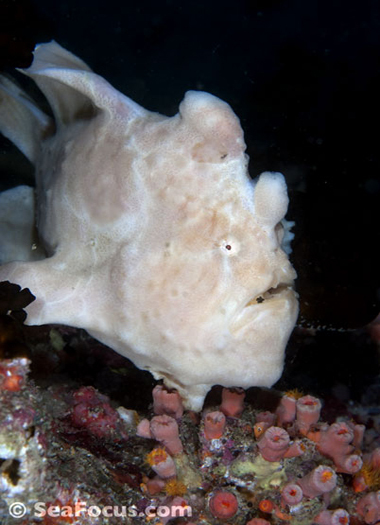 DIVE LOG: The jetty dive site at Kapalai Resort in Borneo is something of a legend when it comes to spotting unusual critters. 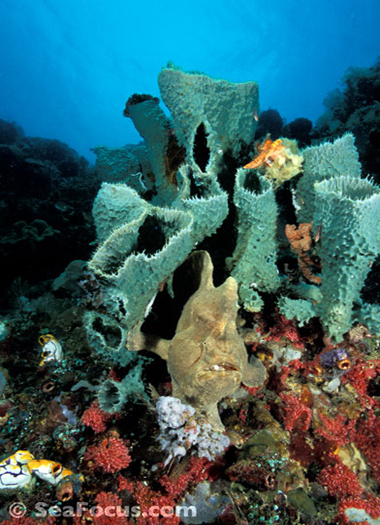 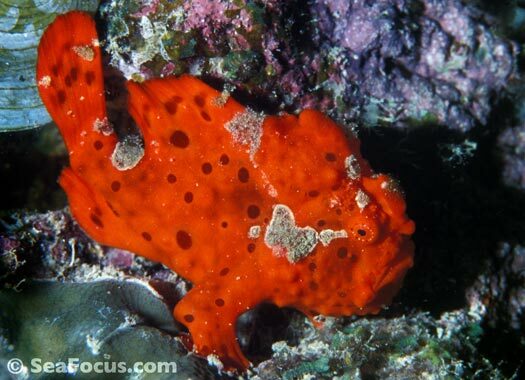 It would take far too much space to list them all as there are so many, including daily sightings of frogfish species. 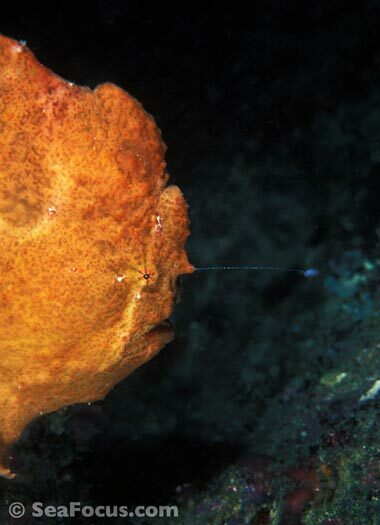 On our last visit this pale pink one was always sitting in the same position and we could watch him waiting for prey to pass by. 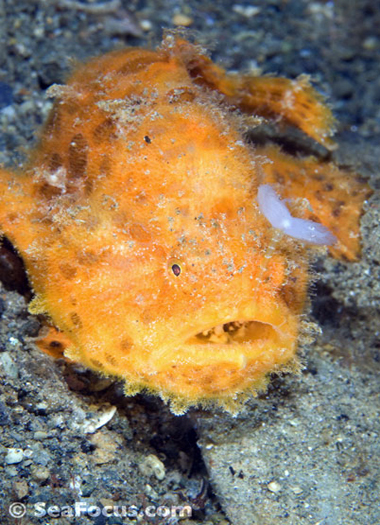 Although this yawning action can indicate hunting, on this dive we watched him yawn several times in a row and managed to capture the shot. 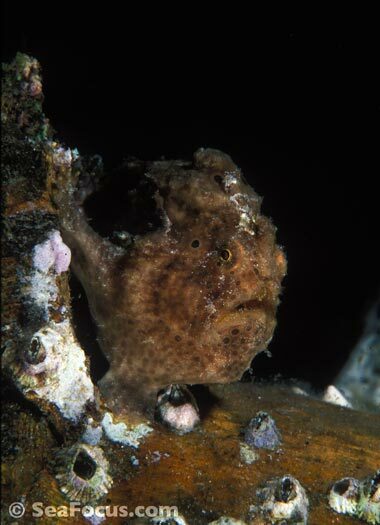 His lure isn't extended so maybe he was bored with being watched? 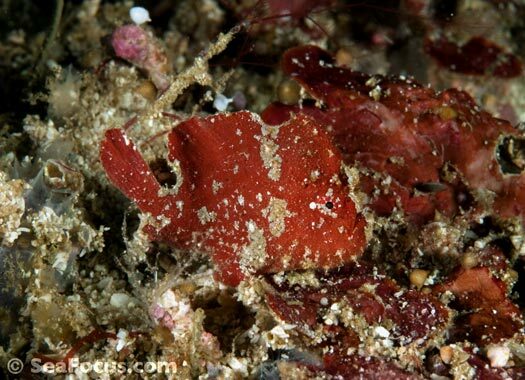 SPECIES NAMES | Many fish can be hard to identify as they are so similar. 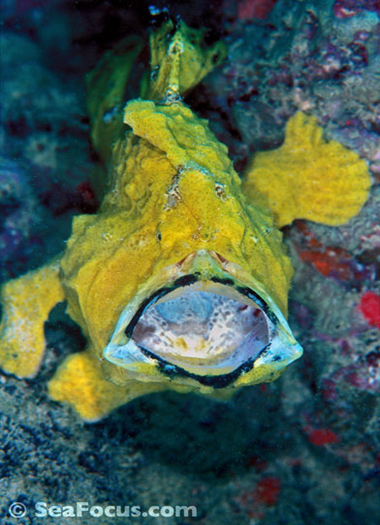 Common names vary and even scientists disagree on what is what. 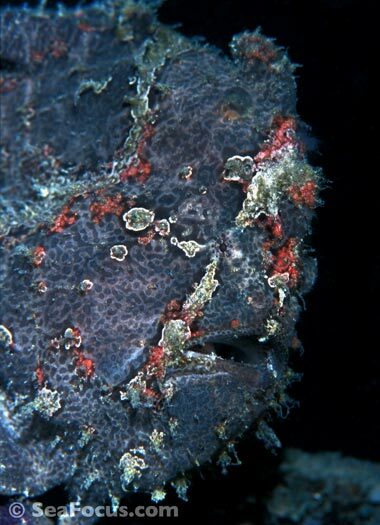 If you can name anything we can't, please get in touch.